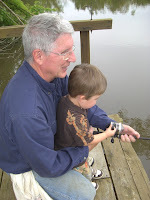 Everything I needed to learn about fishing so far, paw paw has taught me! This is Levi's first fish! 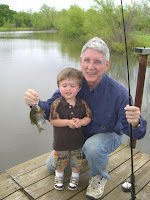 He caught it with Paw Paw! He loved it till it started flapping him in the face. That just wasn't cool and we aren't sure if he will ever do it again. He loved it for a moment though.